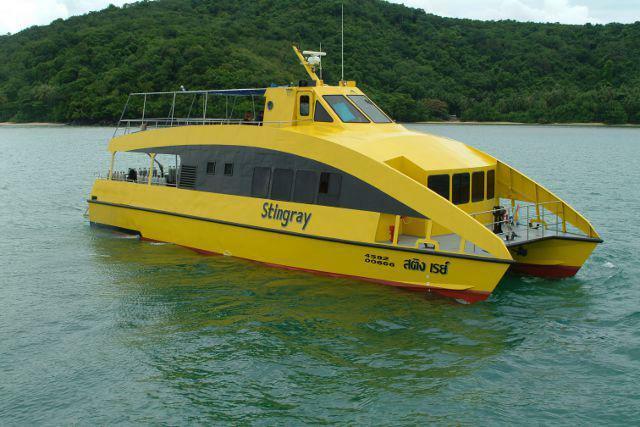 Sorry MV Stingray is no longer sailing/ not running trips. MV Stingray has now been replaced with a brand new boat! 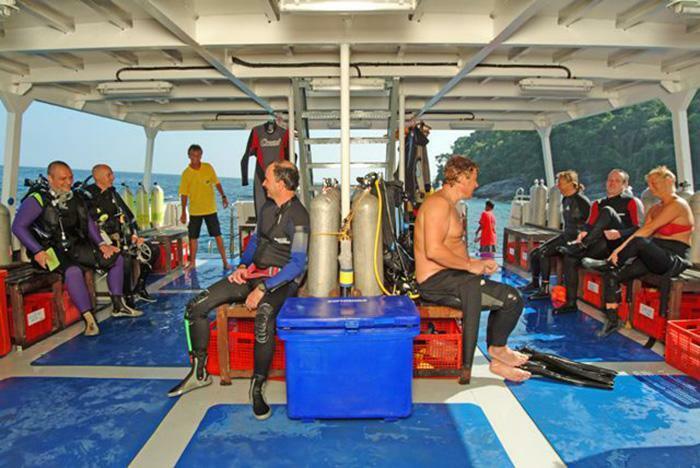 MC Stingray is a German-owned & run catamaran that sails every day of the week to some of the best diving spots in Thailand. With its colour and shape, it’s the most easily-recognizable boat at the Similan Islands, and it certainly has an excellent reputation for good reason. The boat, the staff & crew and the service they provide is second to none. At 23 metres in length, this day trip boat is longer than some liveaboard diving boats, and with a beam of 7m, it is wider than just about everything. What does this mean to the passengers on board? It means smooth and safe journeys and plenty of space to move around. 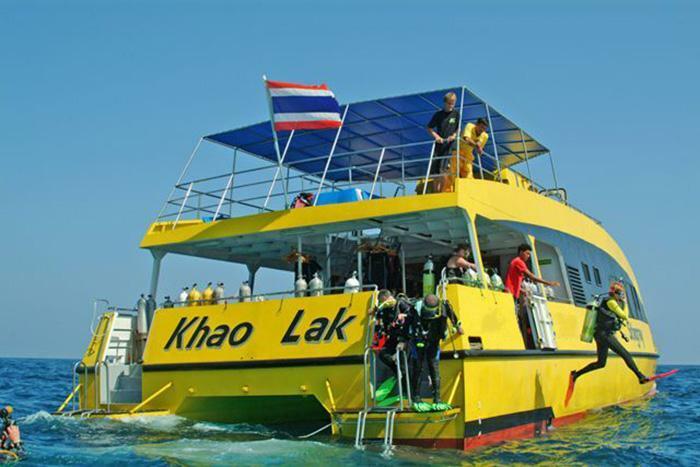 This includes on the large and well-planned dive platform as well as the lounge & dining area and sun deck. This twin-hull catamaran can easily, safely and smoothly sails across all kinds of sea conditions, ensuring that each diving day trip is comfortable, safe and enjoyable. Thai hospitality blends perfectly with German efficiency, ensuring that each trip, from hotel pick up in the morning to drop off in the evening, is pleasant and on time. Guests enjoy lots of great food and beverages during the trip, as well as the use of a personal towel. 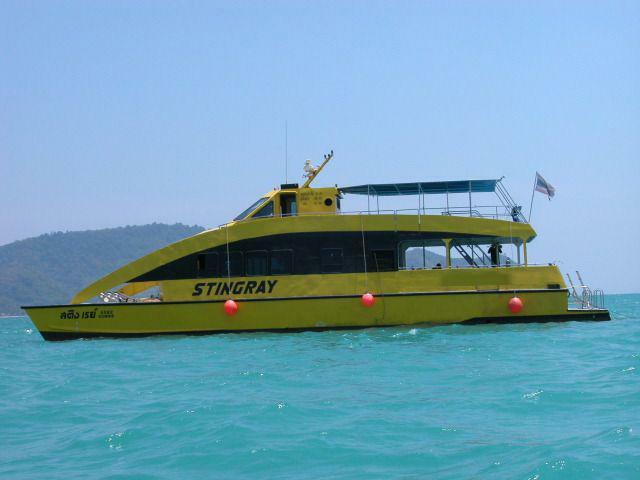 Stingray varies trips to different Similan Islands and Koh Bon during the week. Most days are at The Similan Islands, which have pristine beaches to visit during lunch. Every Tuesday and Saturday Stingray goes to Koh Bon, which is famous for its awesome diving and possible Manta Ray sightings. Stingray leaves from Khao Lak's Tab Lamu Pier at 8.00am. Breakfast is served on board while Stingray sails out towards the Similan Islands. Lunch is served during the surface interval. A light meal is served on the way back to Tab Lamu. Engines: 2x MAN Diesel Engines. Navigation: GPS, Radar And Depth Sounder. Safety: Telephone, First Aid Kit, oxygen Unit. There are a range of diving courses available on Stingray, and these include 'Introductory Dives' for those who have never dived before, 'Scuba Reviews' for those who are a bit rusty, and learning to dive or advancing your level. Please let us know your needs and preferred language, and we will be able to prepare the best and most appropriate diving course for you on one or more day trips aboard Stingray. There are many locations from which you can be picked up from (and/or dropped off at). Guests from Phuket need to make their own way (by private taxi) to Tab Lamu Pier. Those who spend the night before a day trip in Khao Lak can take advantage of free local pick ups. In fact, instead of having to visit the dive centre the day before a trip, normally the arrangements can be made over the phone or by email and final payment etc can be done at the pier in the morning. Prices are 'per diver' and include local pick up, breakfast, lunch, Divemaster guide services, 12 litre (air) tanks, weights & belts. 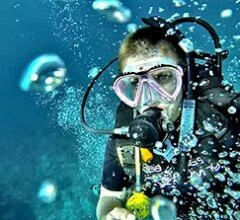 National Marine Park fees (700 THB / diver) are payable in cash to the local authorities. 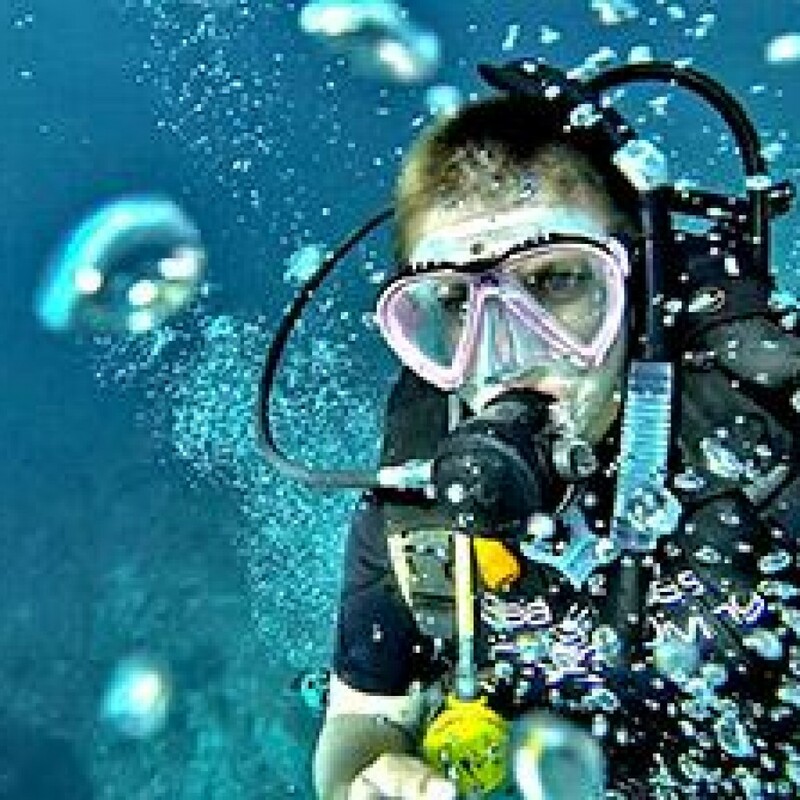 Divers who need to rent scuba equipment can do so at an additional fee (900 THB / day), and receive the very best quality and condition rental equipment.